How does a student qualify for Title I assistance? Multiple criteria are considered when deciding whether there is a need for Title I assistance beyond the regular classroom curriculum. The criteria include: state assessments, assessments used within the ReadyGen and enVision 2.0 curriculums, AIMSWebPlus assessments, teacher observations within the classroom, as well as any isolated delay in mastery of skills. What is the purpose and goals of the Title I program? Title I teachers use the information gathered above to develop the appropriate interventions that a student needs beyond the regular classroom instruction to help them succeed academically. What instruction and activities do students experience in the Title I program? Instruction may be one-on-one or in a small group setting. Activities are developed based on the necessary interventions. These activities may be a reteach of what was provided in the classroom or an isolated skill that should be mastered. Activities may include technology, flash cards, games, etc. Progress monitoring of the intervention is used to measure whether the intervention is meeting students’ needs. How is the progress of a Title I student communicated? Progress reports are sent home with grade cards quarterly. Parents are always welcome to schedule individual conferences with the Title I teachers as well. How can parents and teachers discuss their child’s progress with the Title I teachers? Teachers are available at parent teacher conferences. Individual conferences can be requested by the parents and teachers. Emails and telephone calls are always welcome at any point during the year. 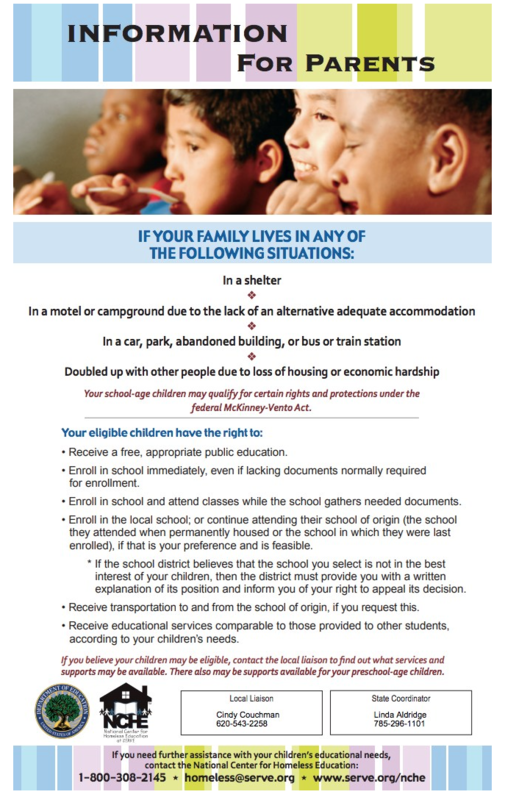 ﻿The McKinney–Vento Homeless Assistance Act of 1987 is a United States federal law that provides federal money for homeless shelter programs. Please click on the flyers below to receive more information about how to receive assistance and who to contact.